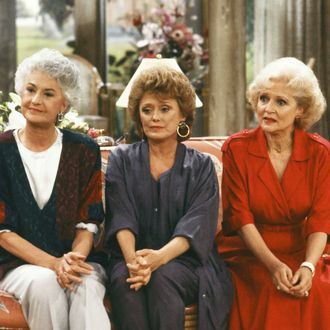 The beloved 1980s sitcom The Golden Girls is experiencing a newfound jolt of interest thanks, in great part, to the streaming darlings at Hulu bringing the entire series to televisions and devices across the country as of last week. (Thank you for being a friend, Hulu!) As with a lot of television programs on the airwaves these days, though, the inevitable question began to loom: Would the braintrust behind GG usher in a new era of fans by rebooting the show? If it’s up to the show’s creator Susan Harris, that answer would be a big, fat no. And frankly, Sophia Petrillo would give you a slap on the face for thinking as such! “They’ve wanted to do Golden Girls the Musical and re-do Golden Girls, and we’ve always said no because Golden Girls would not be Golden Girls without that cast,” Harris explained to Entertainment Weekly. She cited the show’s relatively unsuccessfully one-season spin-off, The Golden Palace, for her reasoning, as it only featured three of the show’s stars: Rue McClanahan, Betty White, and Estelle Getty. “Without Dorothy [Beatrice Arthur], it didn’t work,” Harris said, adding that the series was “what it was and that’s the way it should remain.” Amen to that.